A sweet little protected cove perfect for very young children. This tiny crescent shaped beach has very calm and shallow waters making it an ideal choice for babies. For the adults you will be able to relax as your little ones splash around the ankle-deep waters. Located between the homes at #5142 and #5152. 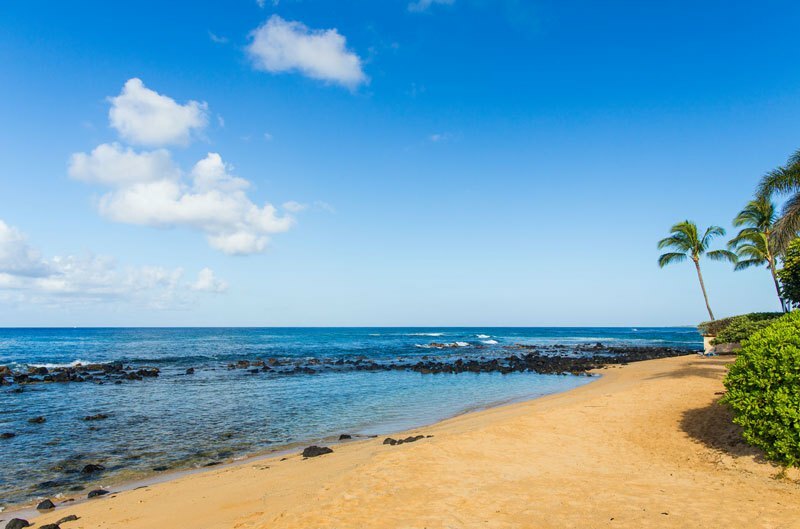 Poipu Beach Park has swimming, snorkeling, and a shallow wading area. Showers, restrooms, and parking are provided. Poipu Shopping Village has a variety of shops and restaurants and is a fun place for free entertainment, such as authentic Tahitian Dance Shows, Fire Knife Dancing and Live Drumming, all free right in the central courtyard. Poipu Beach dining can range from elegant gourmet to extra casual; from Pacific Rim cuisine to Northern Italian. Menus include ultra-fresh seafood, grilled meats, fresh garden herbs, tropical fruits, aromatic coffees, freshly baked pastries, scrumptious sandwiches and so much more. Expect nothing but the best on the sunny South Shore of Kauai. With a dynamic coastline, expansive landscape and temperate year-round climate, Poipu almost can’t help but lure travelers with myriad of adventure activities. The lush Garden Island of Kauai is home to some of the best farmer’s markets in the world. Find a delectable assortment of mouth watering tropical fruits and vegetables in a rainbow of colors. For South Shore visitors and residents searching for locally grown tropical produce, regional sundries and much more look no further. You can find it right here in beautiful and sunny Poipu. Don’t miss your opportunity to support our neighborhood island farmers.